The PSM 300 from Shure is a professional-quality wireless in-ear monitoring system that delivers 24-bit digital audio and offers wireless freedom to performers. It can be used in several environments for audio application such as live stage, theater, rehearsals, houses of worship, and more. It features an audio reference compander that ensures a clearer sound and provides lower noise and audio that have no artifacts. The wireless coverage range extends to over 300' and the system helps eliminate dropouts. The PSM 300 monitor system is easy to setup and operate; it offers one-touch frequency scan and sync to find and assign a clean wireless channel. Adjust the volume using MixMode or stereo mode to create a personal mix from two channels of audio. 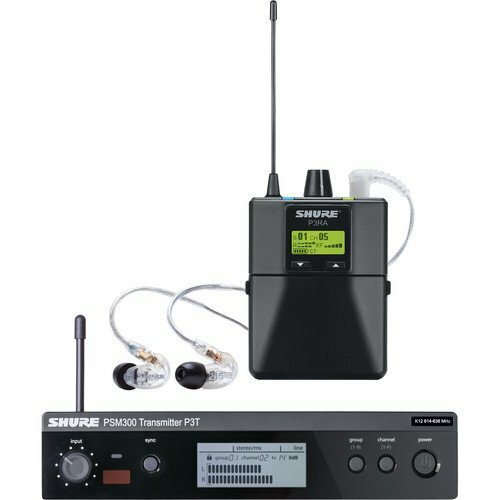 The P3T from Shure is a half-rack 24-bit digital audio wireless transmitter for the personal in ear monitoring system. It can be used in various environments to send 2 channels of audio to a bodypack receiver (sold separately), up to 300' away for applications such as live stage, theater, rehearsals, and more. It features audio reference companding to ensure transparent sound quality with no artifacts or dropouts. This rugged transmitter is built with easy front-panel controls, including the one-touch sync and input level knobs which are there to enable quick setup and easy operation. Furthermore, the rear-panel has balanced inputs and loop outputs that can provide versatile connectivity to other audio sources or other P3T units. The P3RA Wireless Bodypack Receiver from Shure is a compact, stereo wireless receiver designed to be used with a Shure P3T transmitter, as part of the PSR 300 personal monitoring system. It be used by performers and speakers for audio applications in various environments such as live stages, theaters, houses of worship, and more. The P3RA offers 24-bit digital audio clarity with dependable wireless coverage at a range of up to 300'. Automatically find the cleanest frequency available using the scan function. The MixMode and Stereo Mode features allow you to create two independent monitor mixes. A high-contrast LCD screen lets you navigate the menus so you can adjust the mixes to your liking, with control over the left/right balance, a 2-band shelving EQ, and an output gain limiter. The unit is equipped with a rugged aluminum body, which can be clipped onto a belt or guitar strap. Two standard AA batteries provide up to 6 hours of continuous use, and with the optional SB900 rechargeable battery (available separately) you can extend the runtime to up to 7 hours. The Power Save mode preserves battery life when earphones are not connected.